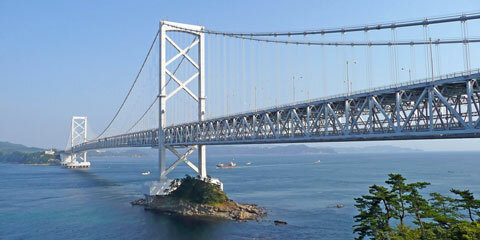 Japan comprises four large islands and several smaller islands that are connected by bridges and a tunnel. Because Japan is situated on a highly volatile area of the earth's crust, it is susceptible to both volcanoes and earthquakes. 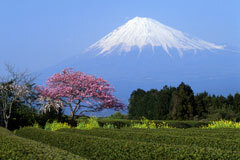 It is the earth's volatility in this area that has shaped Japan's landmass, and Japan's lands are mostly mountainous. 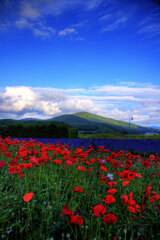 Partly as a result of earthquakes, these mountains and hills alternate with plains and basins. 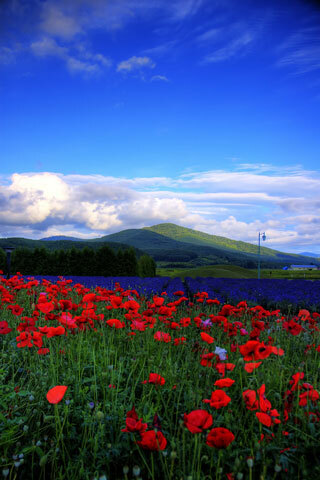 The most rural of the main islands is Hokkaido, which is located in the north. This island supports the most farming, producing more than half of Japan's grains, including wheat. Honshu, located to the southwest of Hokkaido, is home to the Japanese Alps and Mount Fuji, the highest mountain in Japan. This island also encompasses the extensive Kanto Plains, in whose fertile soils many of Japan's crops, including rice, wheat, and other grains, are grown. Honshu is the most populated island of Japan, and is also home to much of its industry and technology. As you continue to travel south from Honshu, you will find the southern islands of Shikoku and Kyushu. These islands are made up of mountain peaks and uplands. These uplands stretch to the outlying Ryukyu Islands. This chain of small islands, also known as the Nansei Islands, has a subtropical climate, and includes the island of Okinawa.